I actually made this dish a couple of months ago, but never got around to putting it in my blog. There’s not much to say about it, other than that spaghetti and meatballs are delicious. What’s not to love about pasta, sauce, and dressed-up meat? 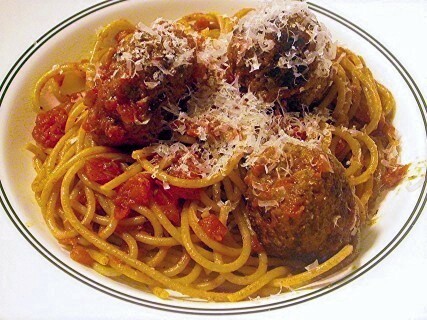 Of course, not all spaghetti and meatballs are created equal. But I’ve had my share of meatballs, and I’ve never had any better than these. This dish is a classic that will always please. CI note: This streamlined recipe can be on the table in under an hour. Bridget note: I find that recipes almost always call for more pasta per sauce than I prefer. Therefore, I would serve this with 12 ounces pasta instead of the 1 pound that the recipe calls for. 1. For the meatballs: Combine bread and buttermilk in small bowl, mashing occasionally with fork, until smooth paste forms, about 10 minutes. 3. Bring 4 quarts of water to boil in large pot for cooking pasta. 4. Meanwhile, heat ¼-inch vegetable oil over medium-high heat in 10- or 11-inch sauté pan. When edge of meatball dipped in oil sizzles, add meatballs in single layer. Fry, turning several times, until nicely browned on all sides, about 10 minutes, regulating heat as needed to keep oil sizzling but not smoking. Transfer browned meatballs to paper towel–lined plate; set aside. Repeat, if necessary, with remaining meatballs. 5. For the sauce, discard oil in pan, leaving behind any browned bits. Add olive oil along with garlic; sauté, scraping up any browned bits, just until garlic is golden, about 30 seconds. Add tomatoes, bring to boil, and simmer gently until sauce thickens, about 10 minutes. Stir in basil; add salt and pepper to taste. Add meatballs and simmer, turning them occasionally, until heated through, about 5 minutes. Keep warm over low flame. 6. Meanwhile, add 1 tablespoon salt and pasta to boiling water. Cook until al dente, drain, and return to pot. Ladle several large spoonfuls of tomato sauce (without meatballs) over spaghetti and toss until noodles are well coated. Divide pasta among individual bowls and top each with a little more tomato sauce and 2 to 3 meatballs. Serve immediately with grated cheese passed separately. This look SO good. 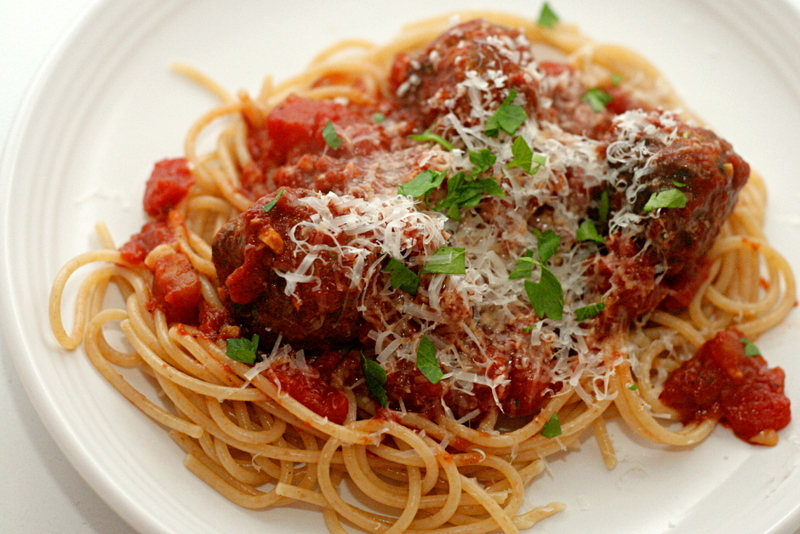 I made spaghetti & meatballs last month for Valentine’s Day. I came across this recipe yesterday and I just happened to be making spaghetti for dinner last night…my plan was to serve my normal meat sauce with the spaghetti…meatballs are usually kind of bland…anyway the meatballs were FANTASTIC! I used ground mild italian sausage instead of ground pork because that’s what I had on hand….THANK YOU! Thank you so much! I have the Cook Illustrated book this recipe comes from but of course the book is in the US and I’m in Argentina. Buenisimo! The recipe from the book is meant to be even faster; it says to cook the pasta (after breaking it in half) with the watered down pasta sauce and meatballs. This takes total cook time down to 30 minutes when using packaged sauce (or so they say). Gail – It just means regular milk – in this case, the recipe is trying differentiate from the buttermilk alternative. I made the meatballs this morning, except baking 25min at 400. I tested one, without sauce. They were very tender which I enjoyed, but did you notice a tang due to the yogurt? Georgi – I’ve never eaten them without the sauce. When I brown them on the stove, they don’t finish cooking all the way until they’ve simmered in the sauce for a few minutes. (This probably isn’t actually true; it’s just an idea I have stuck in my head.) Once they’re mixed with the sauce, I don’t notice any tanginess from the yogurt.